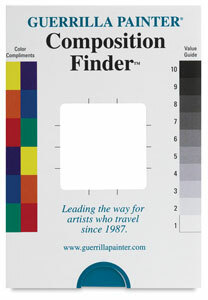 You can improve your paintings by using art composition structures that have been used in great paintings for centuries. These basic art composition elements act as a building blocks you can use to simply and boldly design your paintings. Mix and match these elements to create a dynamic composition for your own paintings, and as you study other people's paintings, look for these same elements to see what works and what does not work in their composition. The more you ingrain these principles into your consciousness and use them as guidelines in your art, the stronger your compositions will become. Divide the surface into two unequal parts. The dividing line can be either horizontal or vertical. The elements can be biased toward any of the sides: top, bottom, left, or right. Next, introduce an element perpendicular to that dividing line to offset the design (and create the “L-shape”). The L-shape design is the a very commonly used structure in landscape paintings, where it creates a sense of peace and serenity. 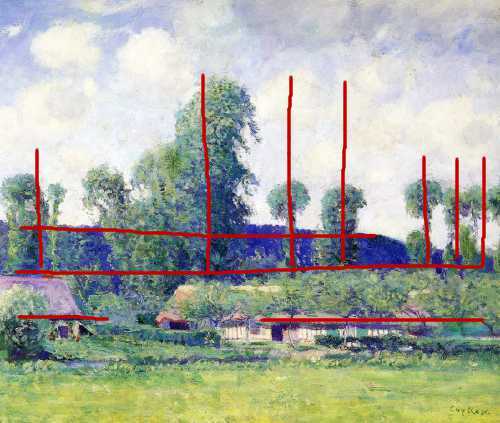 You can use a multiple L-shapes to further enhance your painting, as illustrated below in the painting by Guy Orlando Rose. The line of trees is played against the horizontal line of the roof and the horizon. In this design, you create a winding line, preferably with most of the twist toward the bottom of the painting. This offsets the painting's design, and the S-shape will draw your eyes into it. You can use it to guide a viewers eyes through the painting. Usually, you will use the S-shape to direct attention to the focus of the composition. Diagonal lines in paintings are great for creating a dynamic design. They create tension, and thus a visual interest, in a painting that is different from horizontal and vertical lines. 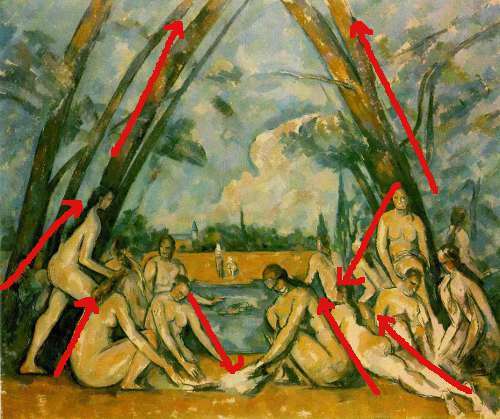 An example of this design technique is shown in the painting by Paul Cezanne, entitled “Bathers”. He apparently was aware of using the diagonal lines of the bathers' bodies to create a very strong composition. The diagonal direction also was accentuated in the tree trunks above the bathers. Place two masses of unequal weight adjacent to each other to create a dynamic relationship. Make sure there is a little space between the two shapes to create a lever to connect the two masses. Use clustered shapes or items (as opposed to scattered shapes), to add weight to a composition. 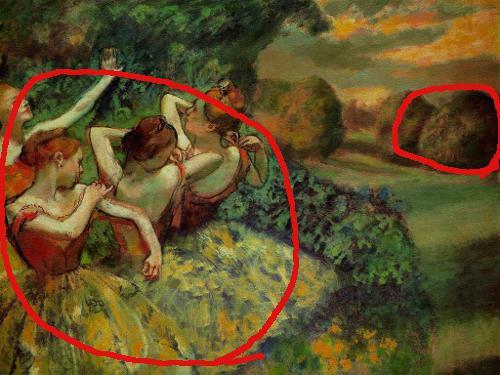 The painting “Four Dancers” by Edgar Degas uses this design element. He lumped the the four dancers to create one large shape against the small mass of the trees to the right. In turn, this relationship between the dancers and the trees beautifully illustrates the concept of the fulcrum. This is a step beyond the diagonal design element. 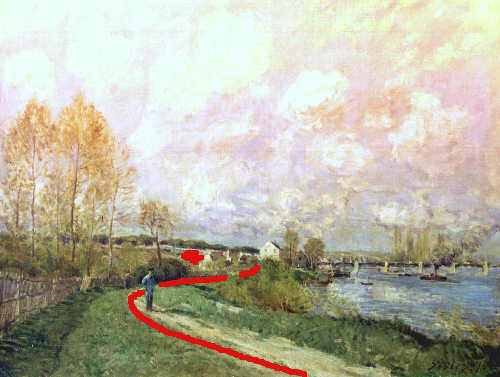 You create lines from various points in your painting which converge at the focal point. These radiating lines guide your eyes to the focal point and hold them there for a while before you travel to other parts of the picture. Do this exercise at home- study the great paintings of history or your favorite contemporary artwork. Analyze why they are well designed. Good paintings are not created accidentally. Chances are that you can find a lot of composition rules being applied in them—either intuitively or deliberately—by the artists. You will gradually internalize the 'hidden' design elements and be able to use them in your art. 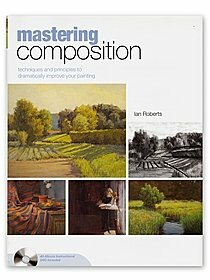 Rendering a painting with a poor composition is a waste of time and good paint, so get started and learn everything you can about composition. Discover what not to do when you compose a painting. Decide first which format to compose with. 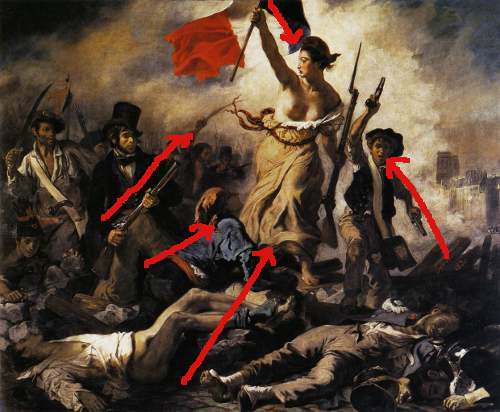 Discover how to draw attention to the focal point in your painting. 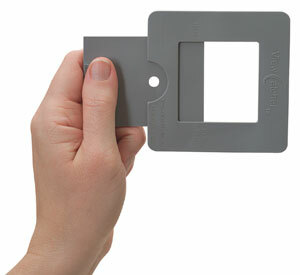 Have not got a view catcher to quickly frame your subjects? Click here to own one! Discover the Art DVD Inspiration here! !